A silver-gilt écuelle with cover and stand. The stepped and domed cover has a finial in the form of a pomegranate and flowers, with a reeded ribbon-tied border. 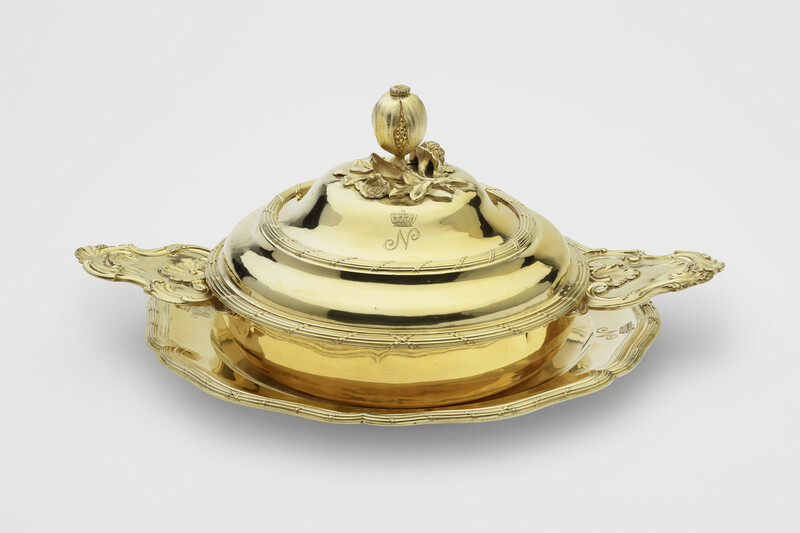 The plain circular porringer has two cartouche-shaped handles chased with scrolls. The stand has an undulating rim. The cover is struck with a Paris assay mark, charge mark and mark of Simon Bourguet; the écuelle is struck on the underside of each handle with the Paris date mark 1762-3, Paris assay mark and mark of Simon Bourguet. The stand is struck on base with the Paris date mark 1762-3 and mark of François Joubert. All parts are engraved NAPOLEON BONAPARTE / 18th June 1815 (the date of the Battle of Waterloo) and with ciphers of N and WF (the latter probably for William Frederick, 2nd Duke of Gloucester and Edinburgh).